The Colonial Series concrete receptacles feature a unique decorative pattern consisting of various shapes of rectangles and triangles that result in a distinctive contemporary architectural look. The cigarette receptacles will add that unique splash of contemporary design to any space while also encouraging the proper disposal of cigarette waste. Spun Aluminum Snuffer Tray Top with Cable Sold Separately. Factory treated with a water-repellent sealer that enhances the appearance of the exposed aggregate and will extend the life of the cigarette receptacle. Most importantly the sealer forms a protective barrier against the elements preventing water, salt or dirt from penetration and then cracking the form. 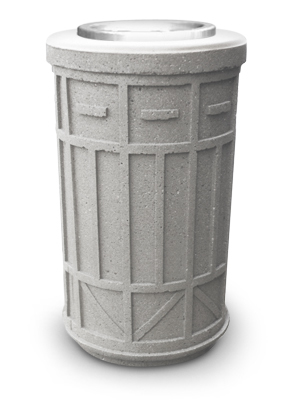 The Colonial Series precast concrete cigarette receptacle is available in Light Sand Blast, Etch, Perma Stone, and Dura Brite finish options. 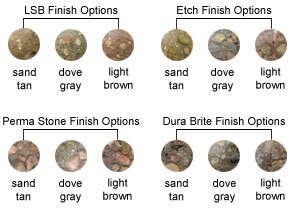 Manufactured from high quality aggregates to ensure all requirements are met according to ASTM standards.